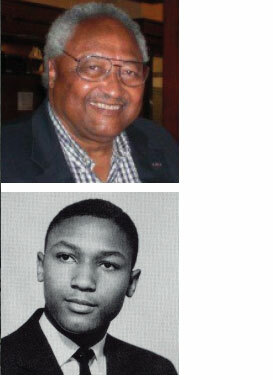 Friends and family mourn the loss of Chuck Bush, who made history in 1954 – the same year that the U.S. Supreme Court officially struck down the practice of “separate but equal” in the landmark Brown v. Board decision. Chief Justice Earl Warren personally sought to integrate the Supreme Court Page Program in 1954, and some believe that Warren viewed it as an early implementation of the court decision that he himself had lobbied for among his fellow justices just months prior. Bush was chosen as the first African-American Page to serve in the Court. After serving from 1954-1957 as a Court Page, Bush went on to become one of the first African-American graduates of the U.S. Air Force Academy and later had a decorated military service, serving as an intelligence officer in Vietnam in 1967-68. To read more about Bush’s life and experiences, click here to read his obituary in the Washington Post. 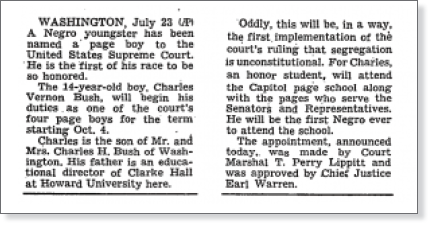 The Capitol Page Alumni Association also uncovered a New York Times article shown right, describing the Page appointment in 1954. If you are aware of any alumni who have recently passed away, please send his/her name, year(s) of Page service, and any other information you might have to alumni@capitolpagealumni.org.